Chef Meny Vaknin works about one hundred hours a week. You'll see him, almost any time, in the open kitchen at Mishmish. He jockeys pots and pans on burners behind him, and delicately plates, drizzling olive oil and sprinkling salt. A skull cap, set back on his head, reveals a dark hair line and accentuates eyes that are aware, it seems, of everything. He makes eye contact with servers, smiles to his new regulars, but, still, remains calmly focused and in the zone. 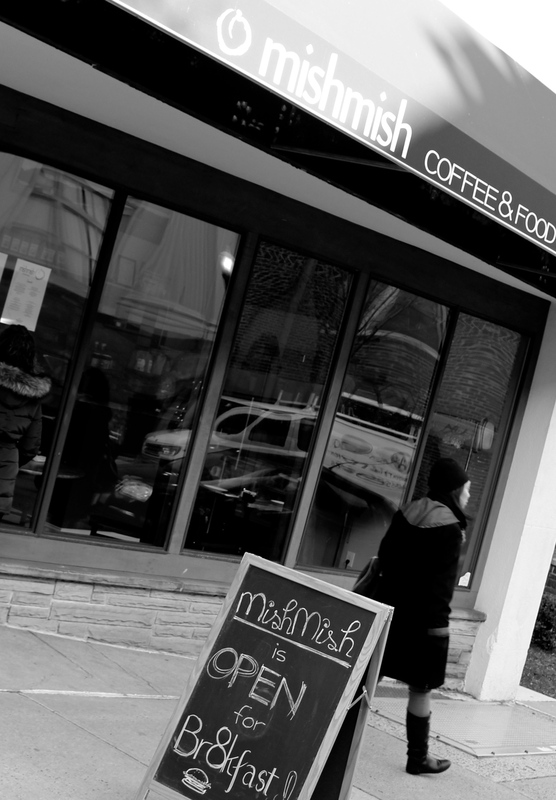 It could be that 215 Glenridge Ave is still vibrating with peaceful Iyengar energy - Mishmish is located in the former Starseed Yoga space - or, it could just be Vaknin’s gentle demeanor, but whatever the cause, the chalkboard sign that reads "Our Mediterranean Home" isn’t lip service. It feels real. It feels genuine. "In the Mediterranean," says Vaknin, "the kitchen is always the main part of the house. That's why I insisted on such a distinct open kitchen, which is a big part of the restaurant. We had to give up some table space in order to do that. I want that interaction with the people. I want diners to feel like they were walking into their grandma׳s kitchen. " One of the reasons that Vaknin is working so much is because Mishmish (apricot in Arabic), is open for breakfast, brunch, lunch, and dinner, and gaining a steady clientele at each service, and for good reason. Vaknin came to United States from Israel 10 years ago. Graduating with honors from the French Culinary Institute, Vaknin went on to work in some of New York’s acclaimed restaurants. He was part of the team that in 2011 opened renowned French chef Daniel Boulud’s restaurant Boulud Sud and went on to serve as executive chef in such establishments as Pera Soho and Grata, then headed the kitchen at Eastwick in Williamsburg, Brooklyn. And, now, he’s chosen Montclair to set up shop! At Mishmish, Vaknin is trying "to create a Mediterranean cuisine that the core of it is rooted in the "Israeli" cuisine and the Jewish Moroccan cuisine, which I grew up on. I want to refresh childhood flavors, smells and memories." There’s a cleanliness of flavor at Mishmish. On a recent brunch and lunch visit, Vaknin treated Mr. Hot and I to a quick cured (48 hours) salmon he had just finished. Cured with a spice blend including whole spices like coriander, then, marinated in olive oil, the salmon, served with labne and wedges of green olive, the delicate flavor of the salmon was clean and mellow, and the texture was superb. There are few things better than a cast iron pan full of runny yolks, stewed tomatoes, feta cheese and za'atar. That's Shakshuka ($10). Savory and flavorful, these Moroccan style eggs are a brighter, more tomato-forward and simpler in flavor profile than Eggs in Purgatory or Tunisian eggs. The lunch menu at Mishmish offers a choice of three small plates for $15. Of the six items in the offering, I chose: (1)marinated beets with labne and watercress, (2)smoked eggplant with feta, lemon confit and za'atar, and (3) local shishito peppers with fleur de sel, olive oil and a hint of fresh lemon. All three hit the mark. I couldn't get enough of the smoky freshness of the eggplant. Set off by the feta and that bit of lemon confit, it struck a pleasing balance of smoke and citrus, there's little wonder that this was the dish named one of Time Out New York’s “100 Best Dishes of 2013" when Vaknin was at Eastwick. The beets, a mix of red and gold, was, again, a balanced blend of earthy sweetness. And the peppers! Simply put, they are a must have! Charred, salty and simple, I can't imagine going to Mishmish and not ordering them again. And, as it is a very generous serving, I'd suggest ordering them as a shared appetizer. Among the other small plate 3/$15 offerings are Marrakesh mussels with dried shatta peppers, garlic, cilantro and oven dried tomoatoes, as well as the new hot vegetable of the moment, cauliflower, fried with lemon tahini, garlic and parsley, as well as Old City Hummus. Rosie Saferstein recently visited Mish Mish for dinner (read her review on njmonthly.com), and I'm clearing my calendar to do the same.